1 x UF-2064 dual receiver comes with any combination of two transmitters, Balanced & unbalanced outputs, 64 band UHF synthesizer controlled frequencies Phase locked loop (PLL) circuitry, Super high sensitivity with extremely low noise Transmission and reception, Stable & quality SMT assembled PCB module, Power & 2 RF LEDs, Squelch control. 2 x FM-64 UHF 64 channel rechargeable transmitter for use with the Gemini UF-Series system. 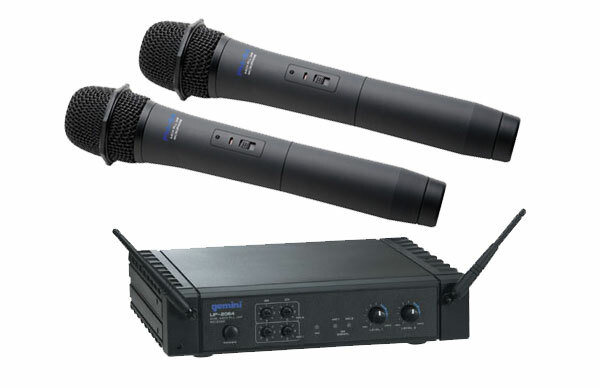 The FM-64 facilitates a Uni-directional dynamic mic with rechargeable battery input. The FM-64 cannot function by itself and requires a UF-Series receiver to work correctly.